Have you ever felt bored with a past outfit? So bored that that special top just sits in the closet unkempt and untouched. Spice it up with a scarf. Scarves have Always had popularity, especially for those of you who live up north and endure blistering cold. 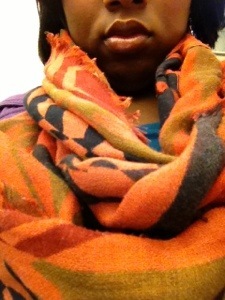 As a southerner I throw on scarves quite often. They keep you warm and oh what a fashion statement they are! When wearing a scarf with any days outfit you will instantly be chique and trendy! It’s like a 3 serving make over! My favorite scarves are the infinity scarves. I make it a little more interesting with the colors of the fall, which are my absolute favorite! I’ll share a pic! Share one back!